Continuously thriving for the greatest design.quality.price. Our company specializes in manufacturing artificial silk & paper flowers, fruits, vegetables, sachets, polyresin, wood wear and tin wear. We have a design team and 300 workers living on our factory campus in China to provide you the latest trends and highest quality at the lowest price point. 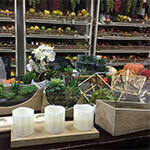 We are your home accents importer and distributor in Chino, California. 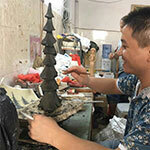 All our products are made in our own factory in Dongguan, China and we have been doing this since 1988. Our innovation and dedication would bring you something special and unique each season. We also specialize in custom designs and will work with you to bring one of a kind product to the market. 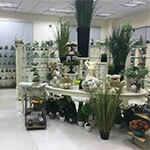 Our factory was established in a small town of Shenzhen manufacturing silk flowers for European customers. In 10 years we grew from 50 to 1200 workers, because of our dedication in quality and price. Flora Bunda (Shenzhen) trading company in downtown Shenzhen was established as we know the importance of service and design. Our bilingual team started closer communications with our Europeans customers and were able to bring custom designs to the market. Flora Bunda Inc. (USA) was established in City of Industry, CA one year following Mr. Song first US visit. He was inspired by the diligent and embracive American people. In 1997, we obtained our first US client and since then have served hundreds of thousands US customers. We continue to partner and learn from the industry leaders and thrive to provide the greatest design, quality and price. We purchased a new factory campus in Dongguan, China of 200,000 square feet. We have 3 showrooms totaling 2,000 square feet which welcome the visit of local and overseas customers. We have a design team and 300 workers living on campus providing our customers the latest trends and highest quality at the lowest price point in home accents.